Never before has an Ontario byelection been so critical in determining the political landscape moving. On Sept. 6, the residents of Vaughan and Kitchener-Waterloo will not only decide who will be their representative at Queen’s Park, but whether or not to give the McGuinty Government a majority. This is the political equivalent of the Leafs making the conference finals with a 3-3 series tie against the Senators. No one thought it would ever happen but everyone is watching. The chosen date of Sept. 6 is far from ideal to encourage student voters. First-year students will be participating in Orientation Week and most upper year students will either be working or preparing to come back to school. In either case, voting in the byelection is the furthest thing from anyone’s mind at such a busy time of year. As if this doesn’t present enough of a challenge, the Students’ Union was informed earlier this week by Elections Ontario that unlike during the general election exactly 11 months earlier, elections volunteers won’t be able to use a list of residence students provided by the university as proof of address. First-years that have been on campus for less than a week will be expected to find some form of alternate address identification. This is an unavoidable problems as it is actually the parties themselves that agree on what can and can’t be used as proper personal and address identification. While a seemingly daunting task, this in no way mitigates the importance of everyone, especially students, to become informed and use their democratic right to vote. 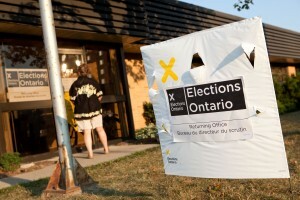 Voter turnout in Ontario is at an all-time low at 49 per cent in the last election and it only gets worse among youth. According to Elections Canada, only 39 per cent of young people between the ages of 18 to 21 vote. Whether you are concerned about your education, jobs, the economy, healthcare or whatever it may be, voting is the easiest thing you can do to have your voice be heard. When people, and especially youth, stop participating in the political process, it will inherently become self serving for those who do. In the 2011 Ontario general election, there were less than four thousand votes separating the top two candidates for Kitchener-Waterloo. This means that it would take only a quarter of Laurier’s population to change the results of that election. If a majority of the students at Waterloo and Laurier voted for the same person, they could unilaterally have elected their own candidate. So, why don’t students participate? Although some believe apathy is the cause, others say this is a misnomer. Students always have strong opinions about their own future and that of the community around them. The issue is not that that students don’t care but rather that students don’t see politics as a medium for change. The speculation is that politicians rarely provide students with an opportunity to contribute in a meaningful way because it’s thought that they don’t care. However, others believe students don’t care because politicians don’t provide opportunity for engagement. While this chicken or the egg argument may be an interesting topic of debate, does it really matter? While I fundamentally believe politicians are eager to engage youth in a meaningful way, this typically only happens when we reach out to them. This can be said with all parties and all levels of government. Conversations can happen and progress can be made, it simply requires some effort on both sides. Whether it is during this upcoming byelection or any other election in the future, be the bigger person, make the first move, prove the apathetic and ignorant stereotype wrong, and VOTE.